Today I’d like to show you a pile of books. It’s a nice sized pile, isn’t it? Notice anything about it? Not the titles (some well-known ones in there, I know). Run your eye down the left-hand side. You might notice some paper, even a piece of string. What’s all that? Well, if you didn’t guess already, those are bookmarks. It seems like I have a problem. I admit, it is somewhat of a problem that I’d like to fix. There are periods of time when it doesn’t occur, however, reading a portion of a book and putting it down only to have another catch my eye and start reading that instead has shown me something about myself as a reader. And that is what I’d like to discuss today. There are many things that plague my reading life. I get easily distracted. I find it hard to sit and read for long periods of time. Because of this, reading one novel could take a week (average, and I’d be pleased with that) or longer. Other readers will devour these same books in a day. Luckily, even with this big different in reading “speed” I think I still enjoy the story the same as devourerers (did I make up a word or just spell it wrong? Oh well.) More on that in a bit. It’s rare that I’ve read a book in one day, but it has happened. Reading one in 2-3 days is an accomplishment for me. Those are often the ones that BLOW ME AWAY, not just blow me away. I’m not trying to get a pity party going. I know I’m not alone in some of these reading struggles. It’s how we’re built. I can’t, often, read a book straight through even when I love it. I said it. I’m proud. I’m a reader. That’s all that matters. What I would like to focus on is some of the interesting things I’ve noticed in the last few years. As a kid I devoured some books. When the Animorphs series came out, I read almost the entire series. Many were read almost as they were released. Then I stopped reading, unless it was assigned to me. It was in high school that I discovered books again, but it was also when I realized I don’t read fast. It took me months to read Hemingway’s For Whom the Bell Tolls (one of the first books I bought when I discovered the local used bookstore). While I read that, I also started and finished A Farewell to Arms and many of his short stories. I didn’t think much of this until recently. Once I started blogging, my reading frequency picked up. 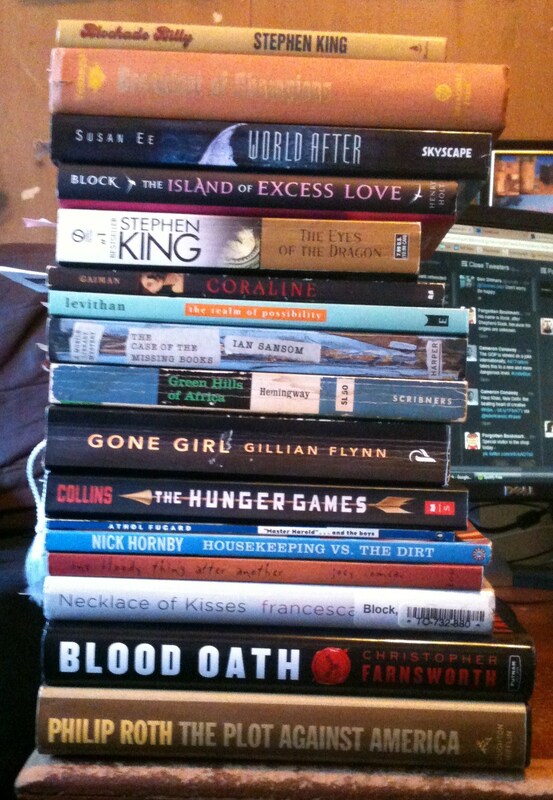 I also didn’t have as big of a pile of half-read books until the last year(ish). I got busy. My mind started wandering. It happens. A great thing about blogging, and more importantly reviewing, my memory for books seems to have gotten much better. Or, I never gave my memory as much credit as it deserved. This is one of the key factors to not being (t00) ashamed of my half-read pile. Most of the books you see pictured above, I can jump right back into and feel like I never put it down. It might take a page or two to recall what I need to keep going, but that’s all. I never would have thought I’d be able to finish some books without restarting them, but I feel that I’ve grown as a reader to the point that these things stick in my head for a long time. Well, once I finish a book, I tend to start forgetting things. But that’s what my reviews are for, and one of the main reasons I started reviewing. They help jump-start my memory after I’m done. 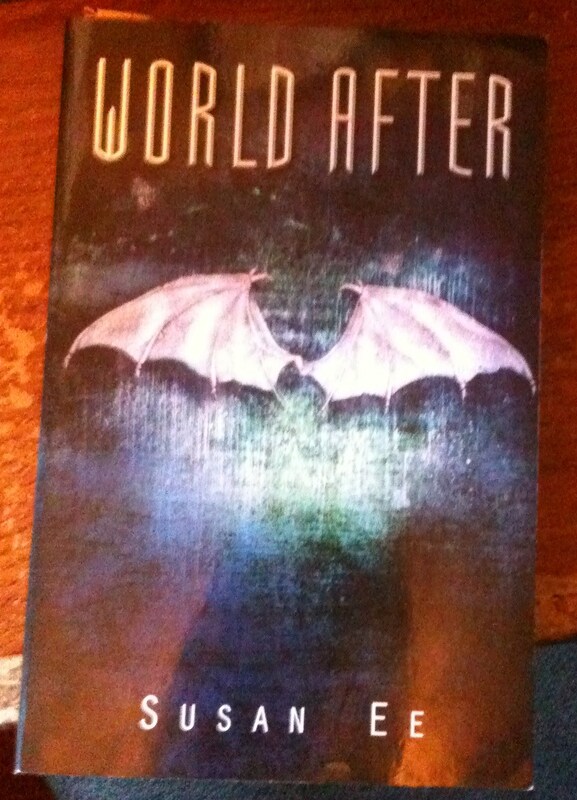 An example of this, World After by Susan Ee. This book was released in November of 2013. I got the book around that time and even started it then. It’s admittedly a fast, very engaging read. But I put it down at some point. Read a chapter or two in 2014…and now I picked it back up the night I started this post. this time, I plan on going to the end. I have less than 100 pages to read now and I’m loving the book. Funny thing is that the same thing happened when I read the first book in the series, Angelfall. It went a little more than half-read until close to release day for book 2. The third book, End of Days is coming out in May and it seems that history has repeated itself. Though, when I get my hands on that book, I’ll have to remind myself there’s no fourth book to wait for and that I should read it in one sitting. The series deserves that after what I’ve put it through. One of the downfalls of this half-reading habit is that I often tell people “yea, that book is on my TBR” or “It’s next on my list. Can’t wait to read it.” Seems innocent enough. Turns out that I say this much too often, and even if I did start the book soon after saying that, I come to realize I have a long line of books on my Kindle that I said I was going to read months ago. This happened in the last few months of 2014. I met many new authors, got myself some great looking books (and also had some gifted to me), had the intention to plow through the pile. I think, as of today, I’ve read two from the pile. That’s almost nothing. I don’t feel too guilty about this. We have our reading speeds. We have lives. No one expects things. I just don’t like feeling left out of things, especially when I interact with most of these authors daily. As always, comment with your thoughts. Do you half-read? I’m sure many of you can’t fathom it. Totally understand that too. I know some of you probably start from the beginning, as well. For me, that’d get into rereading territory, and that’s a topic for a totally different post.